Android is known for the sheer variety of excellent third-party apps available in Google Play that are good alternatives to stock, pre-included apps. Mobile browsers, particularly, are available in the dozens with strong ones like Boat Browser, Dolphin and, of course, Opera Mobile/Mini. Opera Mini was once the world’s most popular mobile browser, but since the rise of Android and iOS, it has lost a great chunk of its share. Still, it offers many features that you simply won’t get in stock browsers on the aforementioned mobile platforms. We’ll get to them in a moment. Now, Opera has released a new version of its Opera Mini browser for Android with a handful of new features and improvements. Check it out past the jump! Major new features in the latest version of Opera Mini [Google Play] – version 7 – are actually of the under-the-hood kind with things like support for OpenGLES-based hardware acceleration (which is geek-talk for “smoother scrolling and better performance”), support for Arabic and Hebrew, support for NFC-based Android Beam feature that comes on Android 4.0 and an Exit button. Improved features include being able to set as many websites on Speed Dial as you like, better tab management and a more refined user-interface for the find-in-page feature. Other than that, Opera Mini maintains its usual set of unique features that make it an absolute must-download for folks on slow mobile internet connections. Opera Turbo compresses web pages on its own servers before sending them to you for quicker access, a tabbed UI, Opera Link to sync bookmarks and settings with desktop Opera and a whole lot more! 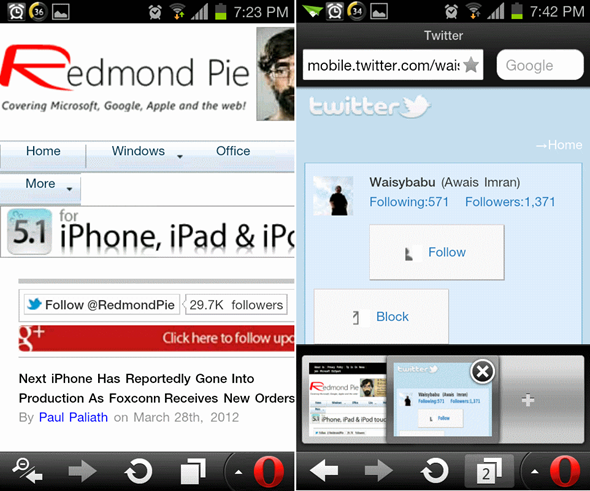 We highly recommend you install Opera Mini on your Android device. Even if you have access to high speed internet all the time, it’s best to keep Mini installed just in case. 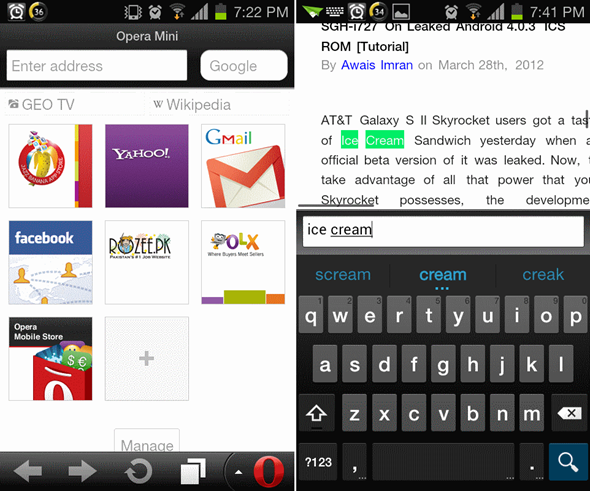 Don’t forget to let us know what you think of Opera Mini by leaving a comment over on our Facebook and Google+ page!